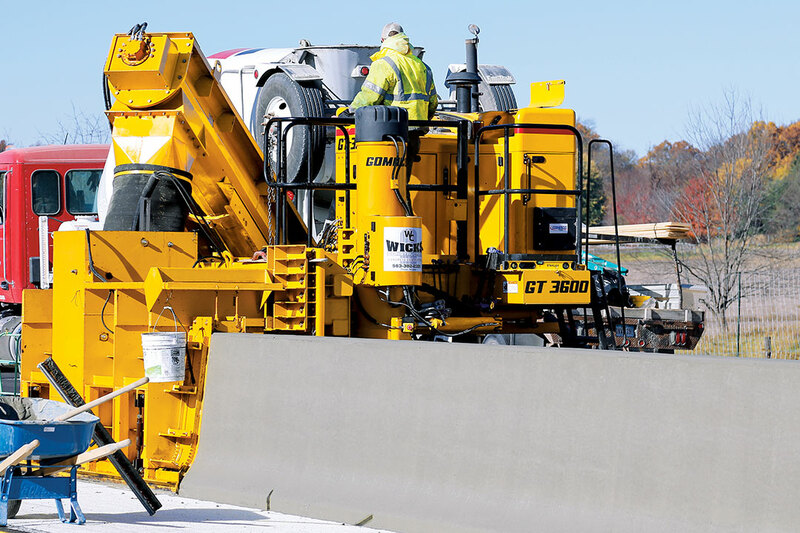 Wicks Construction and their GT-3600 are slipforming 20,000 feet (6096 m) of median barrier and single-face barrier on the Highway 100 new bypass around the west side of Cedar Rapids, Iowa. Wicks Construction Company in Decorah, Iowa, are paving specialists. Their slipform concrete applications range from city streets to barrier wall to curb and gutter and everything in between. They are long-term GOMACO users and have several GOMACO machines. Wicks Construction added a GT-3600 curb and gutter machine to their extensive fleet. They spent that winter preparing for their new equipment and sent personnel to GOMACO University in Ida Grove, Iowa, to learn about the G+ control system in both the classroom environment and hands-on learning in the University’s shop. The GT-3600 gives them a tight radius curb and gutter machine with the versatility to slipform barrier wall when contracts became available. Wicks Construction won their first high-volume barrier project on Highway 100, a new bypass around the west side of Cedar Rapids, Iowa. The project required approximately 20,000 feet (6096 m) of two different types of barrier wall, along with 14,000 feet (4267 m) of curb and gutter. All of it was slipformed with their new GT-3600. The curb and gutter on the project was a 30 inch (762 mm) wide, 10 inch (254 mm) gutter with a six inch (152 mm) curb section on top. The profile also includes a four percent catch. The concrete for the curb and gutter is a standard Iowa Department of Transportation C4 mix design. With the curb and gutter portion of the project complete, Wicks could focus on the barrier wall. It would be the first time they slipformed barrier with a GT-3600. 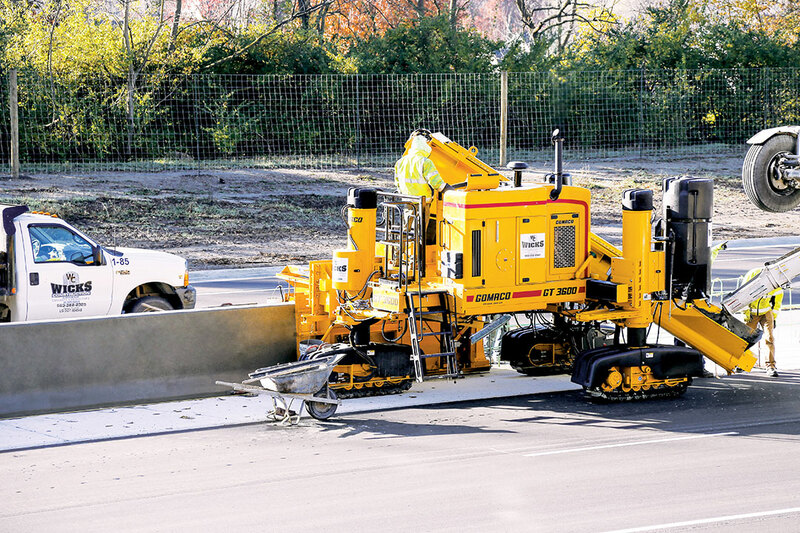 The GT-3600 is slipforming two different types of barrier wall on the project, including 11,500 feet (3505 m) of 44 inch (1118 mm) tall median barrier, and 8500 feet (2591 m) of 34 inch (864 mm) tall single-face barrier. The concrete is an Iowa DOT BR mix with slump averaging 0.5 inch (13 mm). We have Croell Ready-Mix supplying the mix on site and they’ve dedicated five brand new trucks to us,” Wicks said. It’s pretty key because we’re pouring it so dry, but we still need to get it out of the trucks fast enough to maintain production. They’ve been really consistent with the concrete and that’s what will make us or break us is if we have consistent, on-time ready mix. The GT-3600 is equipped with an auger. Wicks Construction feels the auger does a good job handling the dry, low slump concrete required for barrier wall projects. The GT-3600 is slipforming 11,500 feet (3505 m) of 44 inch (1118 mm) tall median barrier, and 8500 feet (2591 m) of 34 inch (864 mm) tall single-face outside barrier. And the finishers are happy. The GT-3600 is putting out a good product and the finishers only have to apply a broom finish and dyed spray cure. The cure for the wall is a clear cure that Wicks Construction dyes a reddish-pink color. The dye is required by the DOT so inspectors can see the total coverage of cure on the new wall. As the cure dries, the dye dissipates and turns white. Joints in the new wall are required to match the median pavement which are every 15 feet (4.6 m). Each joint is saw cut one inch (25 mm) deep and 0.125 inch (3 mm) wide. Wicks Construction Company ‘s first barrier project has been successful and their GT-3600 performed as well as they had expected. They plan on using it for several of their paving projects and getting the most out of the GT-3600’s versatility. 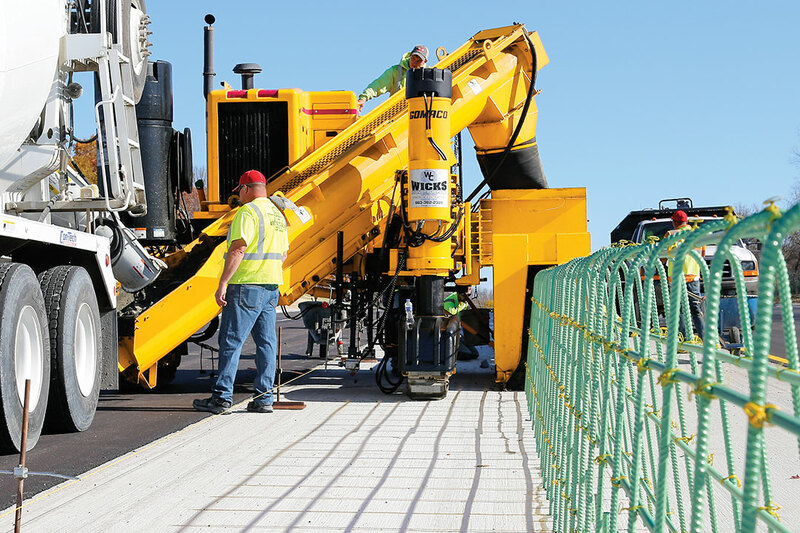 We chose the GT-3600 to do tight radius work and we see it being utilized in our parking lot work and also in radius work on city streets,” Wicks said. “I like its versatility for our company. That was the main thing that drew us to it... more production, less handwork. It puts out great looking curb.